Five bedrooms: 4 x double (two with en-suite shower, basin and WC), 1 x single. Bathroom with bath, separate shower, basin and WC. Ground floor basin and WC. 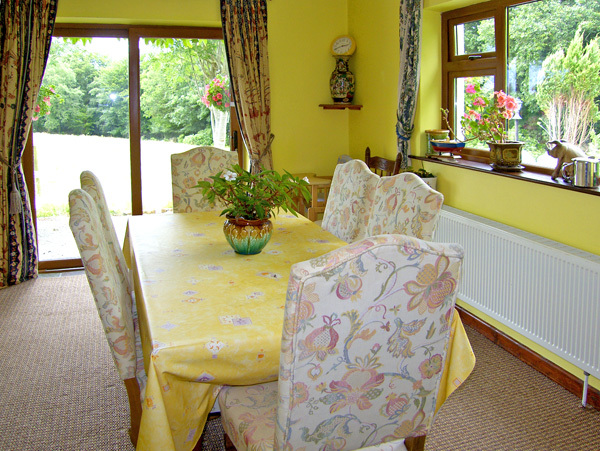 Open plan living area with kitchen, dining area and sitting area (seats 5) with electric stove. Utility. Separate sitting room with woodburning stove. Ballybrack Lodge is a wonderful, detached holiday home set in a fantastic location, right on the Ring of Kerry, perfect for large groups of family and friends seeking to uncover this excellent area. There are five bedrooms; four doubles (two of which have en-suite shower rooms), and a single room to sleep up to nine people. There’s also a family bathroom and a ground floor cloakroom, along with an open plan living area and a separate sitting room with a woodburner. Outside, there is off road parking for three cars plus a garden with decking, furniture and a barbecue. The property is set right on the main road however, so pets and children should be supervised at all times. Ballybrack Lodge sits near the beach and the many amenities of Waterville, with a wealth of attractions within easy reach, making it the perfect choice for your Kerry getaway! Oil central heating with electric fire and woodburning stove. Electric oven and hob, microwave, fridge, freezer, dishwasher, washer/dryer, TV with Saorview, DVD, WiFi, selection of books, games and DVDs. Fuel, power and starter pack for stove inc. in rent. Bed linen and towels inc. in rent. Off road parking for 3 cars. Garden with decked area, furniture and BBQ. One well-behaved pet welcome. Sorry, no smoking. Shop, pub and beach 10 mins walk. Note: The exterior is not enclosed and is very close to main road, so children and pets must be supervised at all times.